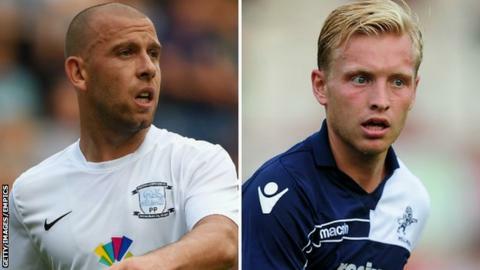 League One side Crawley Town have signed Preston North End's Keith Keane and Millwall's Josh Wright on loan. Wright, 24, joins on a 93-day deal until 13 December, while a three-month agreement for Keane, 27, is effective from Friday. Former Luton midfielder Keane made 46 appearances for Preston last season but has not featured so far this term. Midfielder Wright, who spent time at Leyton Orient last year, has played twice for the Lions this season. Millwall have a 28-day recall clause as part of Wright's deal, with the midfielder ineligible to play in the FA Cup during his spell at the Checkatrade.com Stadium. "Josh is a good fit for us as a hardworking, creative midfielder who has played most of his football at this level or above," Crawley boss John Gregory said. "He's committed to us for three months and we think he has a lot to offer." Keane, who joined Preston in summer 2012 and can also play in defence, is available to feature in the FA Cup and the Johnstone's Paint Trophy. "I think Keith is just what we need at the moment," Gregory added. "He's a winner and he's a leader too. He always wants the ball, he has a great engine and fantastic ability." Crawley are currently 19th in the League One table, having taken six points from their opening six league games of the campaign.